Become more productive in five steps! Everyone has goals and aspirations in life. However, it is common to be in doubt about how to reach these goals. If you can relate to this, then we at Centre O would like to offer you the chance to attend our free seminar on this topic. At the seminar, you will get a better understanding of how to set yourself up for achieving your personal and business goals. The focus is mostly on being productive. We are happy to welcome Mr Patrick Cicha as our speaker to the above-mentioned seminar. Patrick Cicha is a Business Development Manager & Entrepreneur, who had a successful career at an e-commerce development company in Europe. Nevertheless, Patrick wanted to focus on personal development and therefore decided to explore the world. This eventually took him to Hong Kong. He started teaching and blogging about strategies for finding the right decision, direction, inspiration, happiness, and success. He's also launched his first e-commerce store with products for startup entrepreneurs. Briefly said, his life is full of excitement related to personal development, online businesses, and e-commerce development. Now, Patrick Chica is looking forward to sharing all his experiences in the pursuit of helping you become more productive in order for you to reach your personal and/or business goals. The combination of the above listed five will hopefully help you to be more productive which eventually can lead you to achieve your goals. 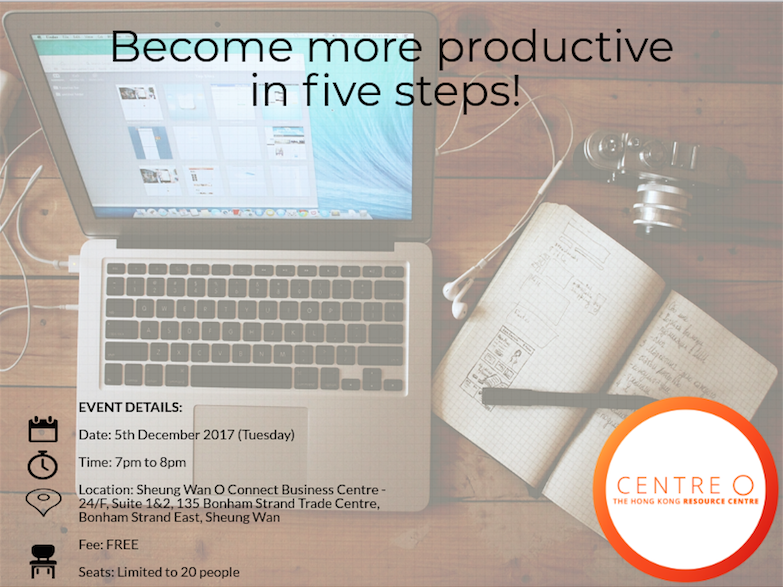 Come and join us for this FREE seminar about productivity.